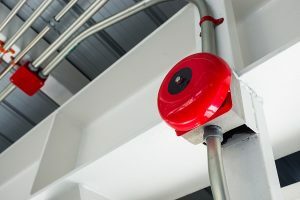 One of the most common complaints about malfunctioning commercial fire alarms is when they won’t stop sounding even when there is no threat presented by a fire. Your building’s fire alarm is a vital piece of life-saving equipment. Every commercial building needs to have one on each floor, and in multiple places throughout the building even if it is only in a small location on one floor. One of the most common complaints about malfunctioning commercial fire alarms is when they won’t stop sounding even when there is no threat presented by a fire. There are several reasons why commercial fire alarms activate. The simplest reason is that there is a fire somewhere in the building, but no one is aware of it. However, if a search of your premises has determined that there is no cause for the fire alarm to activate, then this constitutes a false alarm. The alarm itself could be coated with too much dust or particulates, causing it to malfunction. Alternatively, something could be wrong with the battery built into the fire alarm. To see if this is the case, you will need to contact your fire alarm service provider to inspect the system batteries. It’s also possible that your fire alarm has reached the end of its lifespan and is in need of being upgraded. Replacing detectors and other initiating devices can sometimes correct a problem, but if it does not, the head end control panel may need to be replaced. This will require a fire protection contractor to come out and replace the system and may require a permit. Contact your fire protection provider to find out if your system needs to be upgraded. Sometimes, commercial fire alarms need to be cleaned. Contact your fire protection service provider to clean the alarms. They will start by disconnecting the alarm. They will then clean dust out of the alarm unit by using a hand vacuum or a can of compressed air. This entry was posted on Wednesday, September 12th, 2018 at 11:15 am. Both comments and pings are currently closed.